Like many other cookaholics, we love dinner parties with friends and colleagues. It’s fun designing the menu, fun to shop for the ingredients, and fun to plan the preparation/presentation strategy for the meal. Over the years we’ve learned some “tricks” that make life easier: advance preparation; practicing the exotic dishes beforehand, so as to avoid using guests as guinea pigs; balancing the labor-intensive and easy dishes. This appetizer – that I found at Stephen Cooks! – falls into the “trouble-free” category, to the point that, as Stephen put it “it’s so simple that it feels like cheating“. 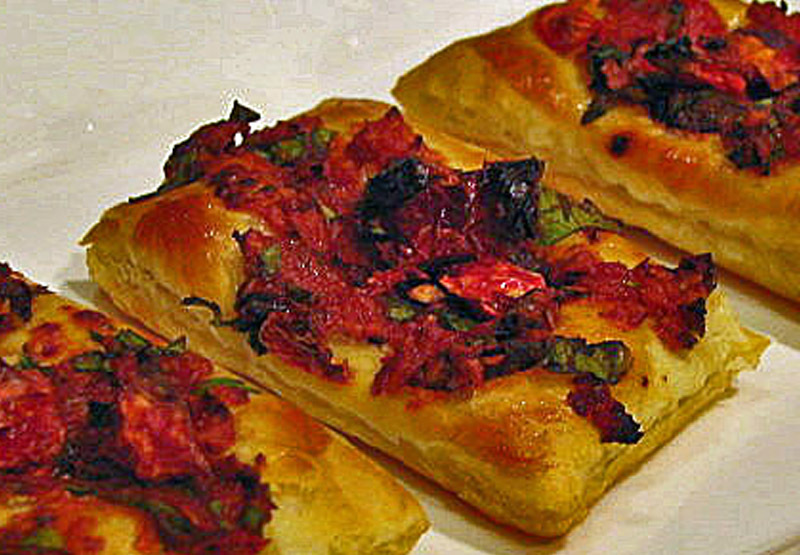 The secret is the use of commercial puff pastry, a life-saver in the kitchens of those who enjoy entertaining. By all means, make your own if you prefer – but, in this recipe the pastry is only a “crostini”, so the frozen product works well and saves time and effort. Allow the pastry sheet to thaw at room temperature, until flexible enough to unfold. Cut in 12 rectangles. Place the cut pieces on a baking sheet lined with parchment paper, Silpat, or use a non-stick baking sheet. Mix the cheese, tomato paste, garlic, olives and herbs. Season to taste. Beat the egg yolk with the water and brush the egg wash on the pastry rectangles. Spread the cheese mixture on each and then top with a few pieces of the sundried tomato. Bake in a 400F oven for 12 minutes or until the pasty is golden brown. Allow to cool five minutes before serving. Comments: When I prepared the cheese mixture it seemed a little too heavy on the tomato. But, it wasn’t a problem, and I slightly increased the black olives; otherwise I kept the recipe as Stephen posted it . 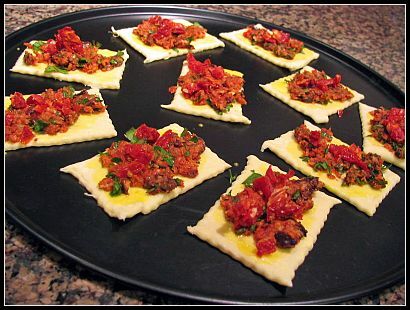 This spread will also work on “real” crostini, of course, but the puff pastry makes the recipe special. Here they are, ready to go into the oven. 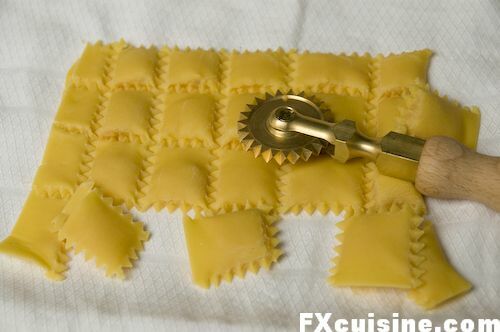 I cut the pastry using a ravioli cutter like this one.